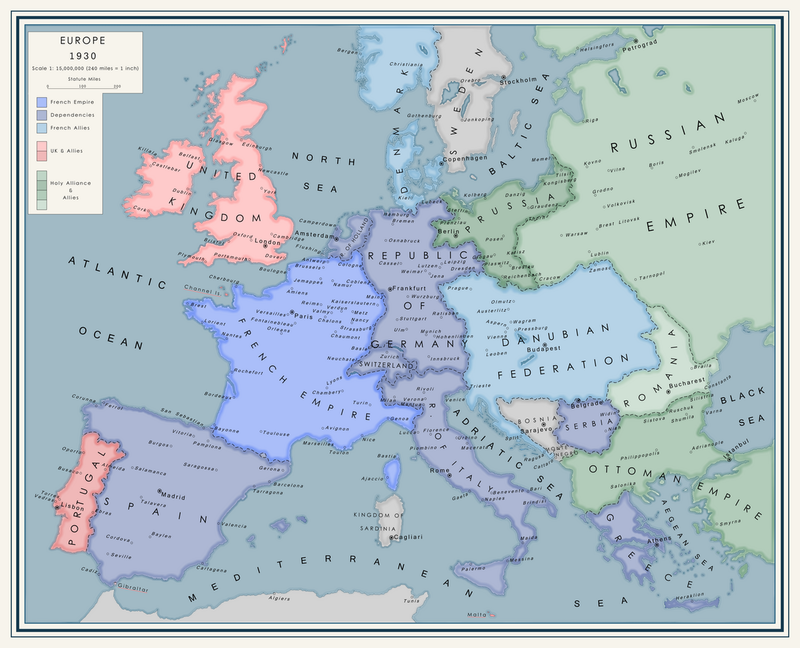 Here is a scenario I've had rumbling around in my head for quite some time, about my own take on a universe with a successful First French Empire, one of the more popular scenarios in alternate history. In this world, the divergence occurred with a more intelligent Napoleon who did not exploit his allies, particularly Spain, so much and managed to end the war in Europe after years of heavy fighting via treaty with Great Britain and Russia in 1814, and so quiet settled over Europe. However, while the Continental System worked while Napoleon was alive, it did not hold together too long after him. After the passing of Napoleon Bonaparte, control of the Continental System and of the First French Empire passed to Napoleon II, who quickly made a mess of things. By trying to rule with an iron fist but lacking his father's charisma, daring, or intelligence, by the mid-1840s the Continental System began to come apart. Revolutions tore through much of Europe, creating new states overnight and forcing Russia, Britain, and Portugal to hold off striking France while it was down to deal with their own domestic problems. For a time, it seemed as if France would fall on its own, were it not for the intervention of Maximilian Joseph Eugene Auguste Napoleon de Beauharnais, nephew to Napoleon II via Napoleon I's first marriage and husband of Grand Duchess Maria of Russia. Originally sent by the Russians to try to calm France and perhaps let Napoleon II fall and France with him, Maximilian instead took the support given to him by the French nobility and ruling classes, who in their distaste for Napoleon II would side with anyone, and gathered enough support to enact the so-called "Quiet Coup" upon Napoleon II in 1848. Spiriting Napoleon II out to Corsica, where he would live out his days in his family's mansion, proved to be the easiest part of the coup, as Maximilian, now taking on the title of Emperor of France, was forced to wage war to settle down the extremist revolutionaries in France while settling with the revolutionaries in the countries outside of France. In the end, the Continental System fell, to be replaced by the Continental Alliance with the new nations of Germany, Italy, Holland, and the Danubian Federation that had sprung up in place of the previous states under France's protection. Under the Continental Alliance, nations dependent on or allied to France would have equal partnership in all affairs foreign and domestic, and would be allowed sovereignty separate to France's own. In addition, Maximilian gave the Papal Lands to Italy in exchange for a permanent presence in the Vatican as well as the Pope staying for 6 months of every year in Avignon, and set free the more rebellious lands in Germany to better consolidate France's gains. In the end, the new alliance proved to work with the new governments in place, and became the largest and most powerful alliance in Europe. For his treachery, Russia never forgave Maximilian for stealing away the Grand Duchess and betraying them, and formed the Holy Alliance with Prussia in 1852 (joined by the Ottoman Empire in 1901) to fend off the French in Europe. The Holy Alliance and Continental Alliance have fought many border clashes since then, and even two wars, the latter of which, lasting from 1912-1914, resulted in the freeing of Serbia and Bosnia from Ottoman rule as well as the expansion of Greek territory beyond the pittance they had originally been given. Even years later, in 1930, the Russians and Prussians hold a strong distaste for France, even while pushing their affairs toward the East and the quagmire that is China, seeking to gain a greater foothold than Britain or her ally China. Britain, ever the enemy of France, was eventually forced to move its affairs beyond Europe with a disastrous war in Egypt against France and an even worse war for the Turkish Straits that ended British dominion over Europe. Instead, the British grew their alliance with the United States into full partnership and expanded their influence over much of the Americas, save for the French ally that is the Empire of Brazil. The British Empire is still the largest in the world and, despite its lack of a presence in Europe, is still one of the strongest nations on Earth. Though, in recent years, the strength of the British has begun to be supplanted by their American allies, who are rapidly growing into a superpower themselves. It is, in fact, the growth of Russia and the United States toward superpower-dom (the latter more than the former) that has prompted France's push for a more unified Continental Alliance via the Continental Free Economic Zone (CFEZ). Under the CFEZ, the nations allied to or dependent upon France would share a policy of open borders and a shared market for their goods to travel between nations, as well as strengthening the military ties between all members. In Paris, Maximilian II dreams of someday uniting the Continental Alliance into a single nation, a "Europa Universalis" that would be a superpower unto itself. While France is, without a doubt, the strongest power on the ground in Europe, and its colonial empire still great, a push toward uniting with much of Europe would keep the British and Russians from ever standing against them. His ambitions are well-supported within the Continental Alliance. The peoples of the allied nations have enjoyed reaping the benefits of their alliance, particularly after the last war. Fair wages, good working hours, pensions, the beginnings of nationalized healthcare, and more have spread through the CA. Even without the CFEZ, art and entertainment is distributed freely around the CA. The prestigious universities of Denmark, for instance, already open their doors to all students from the CA, and have thus gained a reputation of academic excellence in Europe. Budapest, the shining capital of the Danubian Federation, reigns as the second-greatest city in the alliance besides Paris, and is a major hub of Eastern European art, literature, music, and cinema. Germans, Spaniards, Italians, Greeks, Serbs, Dutch, Danes, and French have come together to make the Continental Alliance one of the greatest alliances in the entire world. Now, it is up to Emperor Maximilian II to keep it that way against the Russian and American giants.